Milk Thistle is a great herb for liver support. But what does liver support mean? Our red blood cells have a life span of approximately 120 days. Some skin cells replace themselves within 4 weeks. Muscle cells have a lifetime of a decade. The cells in our body are subject to change all the time. The main organ which facilitates this metabolism is the liver. Naturally, the liver operates best under optimal circumstances. Alcohol, medication abuse, diseases or simply the nowadays common western food lifestyle can put a heavy strain on the liver. 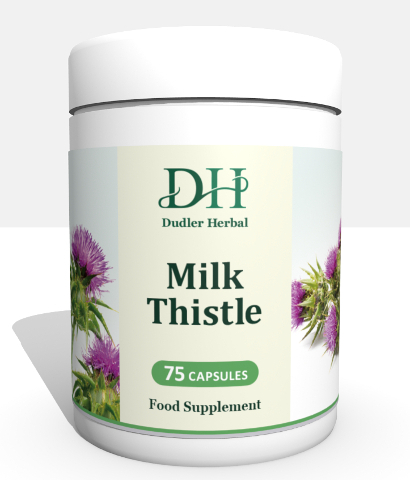 Consequently, Milk Thistle is often used for metabolism dysfunctions like Diabetes where elevated fasting blood sugar and Hyperlipidemia are present. But the herb may also be useful in Dyspepsia or certain forms of Hepatitis. Our supplements are produced without any “flow agents” and “anti-caking” agents. We manufacture in a slow, gentle process which exposes very little or none electric smog to the herbs. All products are tested in a combined automatic and manual quality verification and are batch controlled with full traceability. We only use herbs of pharmaceutical grade quality. We haven’t identified a need for a organic certification for our products. If we do so we will register with the Soil Association which allows us to claim “organic” origin on the label. However, our herbs are mainly sourced from organic farmers or are wild harvested from remote places. We consider sustainable wild harvesting as prime herb quality which organic farming cannot compete with. Food supplements should be taken as a preventative measure, in case of Milk Thistle to prevent harmful oxidation caused by a stress processes within the liver. It is thought that the anti-oxidative and thus hepato-protective effect of Milk Thistle is mainly exerted by the flavanolignans and flavonoids. The flavanolignas silydianin, silychristin and silybin are known as silymarin and may be found in up to 3% in the seeds. The dose for a preventative supplementation is specific to each individual needs and may start from 1 capsule per day. An intensive supplementation would be 1 capsule 5 times a day taken 30 minutes after a digestive stimulant like Globe Artichoke or Trikatu. You can order this product on our online shop. If it may be out of stock please contact the clinic via email or phone. Medical Herbalism, Naturopathy, Sports Injury Treatment & Rehabilitation. All consultations are by prior appointment only. Appointment times are Monday to Friday 8:00 – 17:00.